Back in March the Architects Journal ran an article headlined Major redesign for Olympicopolis to save St Paul’s views. It said that in Nov 2017 the Friends of Richmond Park called upon London Mayor Sadiq Khan to halt the construction of Manhattan Loft Gardens 42 storey skyscraper at Stratford. Simply put, if you looked at St Paul’s through a telescope from King Henry’s Mound in Richmond Park, nine miles away, the skyscraper stuck up behind it. Viewing corridors across London to St Paul’s Cathedral are part of London’s crazy and historic planning system. The builders of Manhattan Loft Gardens said that the protected view maps indicated that the area behind St Paul’s to be protected extended 1.86 miles. Their development is 4.35 miles from St Paul’s. The Stratford Olympicopolis was named after the Albertopolis; the South Kensington museums area which had been funded by the wealth generated by the Great Exhibition of 1851. Prince Albert had been the driving force behind that. East Side, as the Olympicopolis is officially called, originally included 30-40 storey residential towers which were to help the LLDC to finance the whole scheme. The protest from Richmond has now forced a complete redesign. 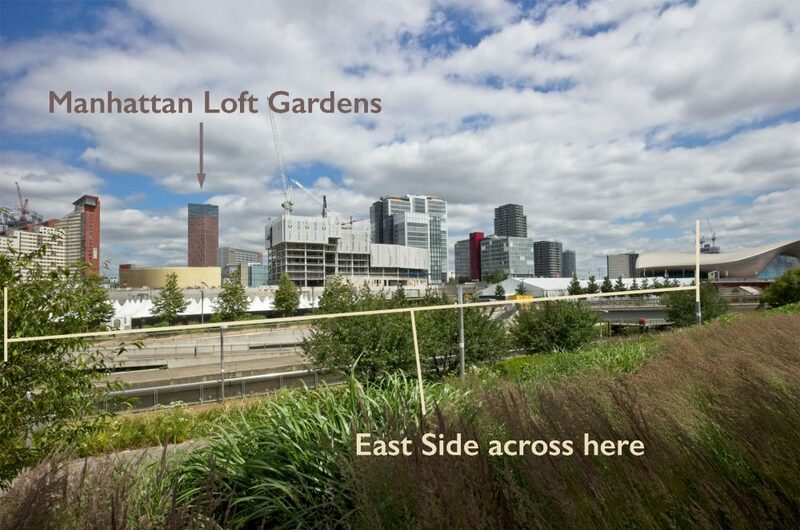 The GLA had granted the planning permission for Manhattan Loft Gardens, so the row ended up on Sadiq Khan’s desk. He has now made changes to the planning process. There will now be four 23 storey residential towers, the V&A will only be a third of it’s original size, but the BBC will now move its orchestra and music recording studios here from Maida Vale. The site of the new cultural quarter is adjacent to and north west of the Aquatics Centre – where the fairground has been. When it finally gets built East Side will be a great addition to East London. It sits next to a big transport hub, and a busy and successful shopping mall. There are many new young residents in all the flats being built across this side of London who will appreciate our new cultural quarter. Above the East Side site from the bridge adjacent to the Aquatics Centre. 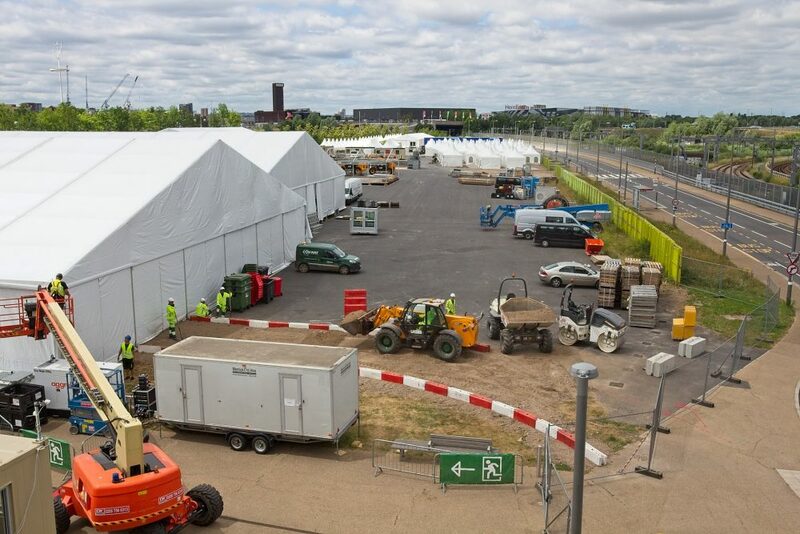 The marques are being erected for an event called Make the Future Live which runs from 5th to 8th July 2018. Tickets are free – book online. Make the Future Live features live music from Lemar on Friday night, and from Ella Eyre on Saturday. There will be science shows, street food, hands-on interactive gaming and more. On the Sunday the Grand Final of the Shell Eco-marathon – the Driver’s World Championship will run. This is where the teams compete to see who the world’s most energy-efficient driver is.